I was tickled by the two animatronic lions ("Patience" and "Fortitude") who guard the main New York Public Library building. With their twitching tails and big paws, these street cats performed a rap number (with special material written by AnnMarie Milazzo and Billy Jay Stein). Some famous paintings at the Metropolitan Museum of Art came alive--the ballerinas in a Degas painting actually danced. In the gaudy verisimilitude of Times Square, the human actor/dancer Danny Gardner (as the George M. Cohan statue come to life) did a terrific tap dance. The real and the conjured overlapped to astonishing effect. All the digital wizardry, stage craft elements, and human talents were seamlessly organized. Kudos to the technical team--it must have been a monster effort to coordinate all the effects. The director and choreographer, Mia Michaels (known for TV's So You Think You Can Dance), brought contemporary dance moves to the stage (including a group of energetic dancers who were not Rockettes). Quite frankly, I had expected tacky Las Vegas-style night club routines, but Michaels has combined the tradition of the Rockettes chorus line with original, imaginative movement, adding some modern vibrancy and class to the time-honored act. Speaking of class, Emilio Sosa deserves special mention for his tasteful and beautiful costume designs. Even the flashy, gold-sequined mini-dresses were stylish--I wouldn't mind having one of the bright-yellow slickers or a floral umbrella from the "Singing in the Rain" number. For a "real" fashion show (on New York's Seventh Avenue), Sosa created dramatic, individual outfits appropriate for any red carpet event. Fashionistas take note. An ever-so-slight book by Douglas Carter Beane was the thread that pulled all the action together: a brother and sister search for their parents in New York City landmarks, and the sister learns about the joys of using her imagination. It's the least successful part of this big, bright, obviously expensive entertainment, but to be fair, it's possible that no human-scale story line could compete with the visual audacity of the production. The New York Spectacular may be thought of for only tourists and children, but that's not really true. While not requiring great intellect to appreciate the show, it's a lot of fun, and it's visually, well, spectacular. 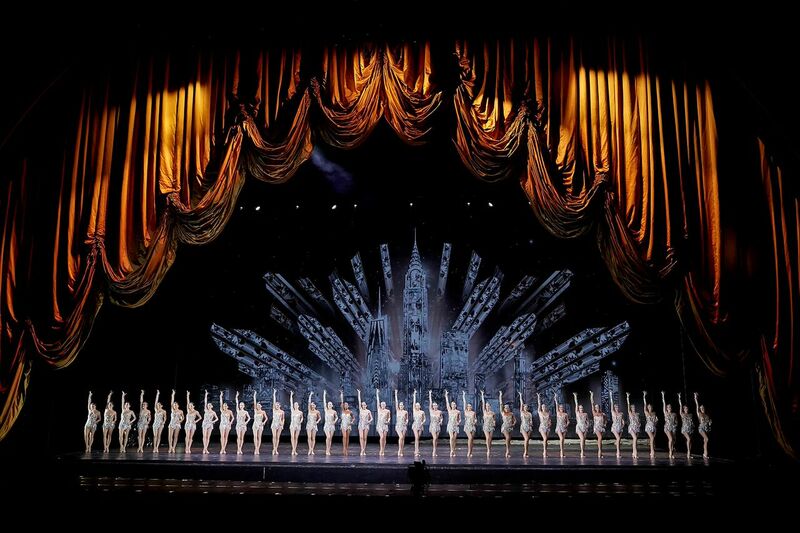 And then there are those iconic Rockettes who've been entertaining audiences since 1932. If you've never seen 36 women doing high kicks in unison, you really owe it to yourself to go to Radio City and see the Rockettes perform live. Looking like a perfect, beautiful human machine--they are amazing. New York Spectacular runs through August 7, 2016 at Radio City Music Hall, 1260 Sixth Avenue, Manhattan. Running time: 90 minutes. Directed and choreographed by Mia Michaels; written by Douglas Carter Beane; music producer and arrangements by Billy Jay Stein; vocal designs by AnnMarie Milazzo; orchestrations by Christopher Jahnke; video and projection designs by Moment Factory; scenic design by Patrick Fahey, lighting by Alain Lortie; costumes by Emilio Sosa; sound by Steve Kennedy. Presented by MSG Sports and Entertainment, LLC. Cast: the Rockettes, Jenna Ortega, Lilla Crawford, Euan Morton, Vincent Crocilla, Kacie Sheik, Danny Gardner, Kecia Lewis, Jacob Ben Widmar, Blaine Alden Krauss and Jeff Pew. Sheila Kogan is a Contributing Writer for ZEALnyc and writes frequently on theater, dance and other cultural events. Want more information about this production? Read ZEALnyc's interview: Danny Gardner comes to life as George M. Cohan in the New York Spectacular at Radio City.